This lightened up Broccoli Salad is the perfect answer to that “what should I bring?” question that comes up for cookouts and parties all summer long. 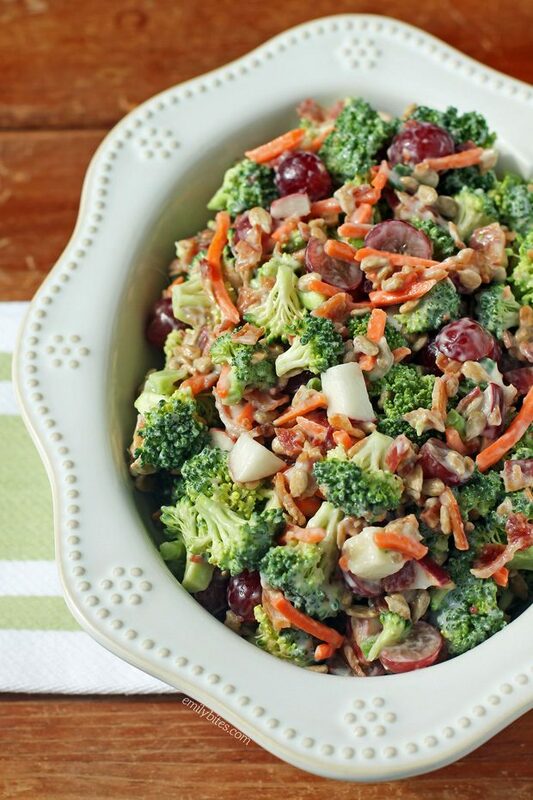 It’s hearty and crunchy with broccoli, carrots and sunflower seeds, smoky from the crispy chopped bacon, fruity with red grapes and apples and all tossed in a sweet and creamy sauce. Plus a generous serving is just 140 calories or 4 Weight Watchers SmartPoints! I laid out the recipe below to serve 6 so that it would work well for those who are making it for lunches or for a side dish at home, but you can easily double or triple the recipe to bring to a party – it’s sure to be a crowd-pleaser! This picnic staple usually contains chopped red onion, but since I don’t enjoy eating raw onion, I substituted scallions and they brought the perfect amount of mild onion flavor. I also used fresh red grapes and apples instead of the more traditional dried fruits like raisins or craisins. It tastes just as good and it’s healthier! When I measured the entire finished recipe it came out to about 5 ½ cups total, so I listed the serving size as 6 scant cups. If you’re eating it for lunch instead of as a side dish you may want to double the serving size. Looking for more tasty lightened up recipes to help you answer “what should I bring?” Check out my Doritos Taco Salad, Cannoli Dip, Cheesy Potluck Potatoes, Cheesecake Stuffed Strawberries, BLT Dip, Buffalo Chicken Pasta Salad, Greek Layer Dip, Zucchini Casserole, Strawberry Balsamic Bruschetta, Greek Orzo Pasta Salad, Mixed Berry Mini Tarts, Fiesta Hummus, Spinach & Artichoke Dip, Zucchini Squares, Chocolate Fruit Dip and many more in my recipe index! Place the chopped apples in a large mixing bowl and add the lemon juice. Stir to coat the apples. 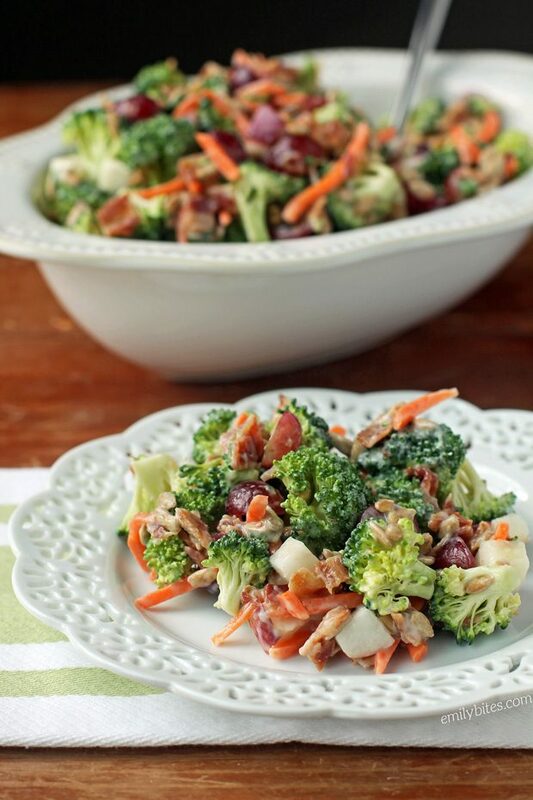 Add the chopped bacon, broccoli florets, grapes, carrots, scallions and sunflower seeds and stir until well combined. In a separate dish, combine the mayonnaise, sugar and apple cider vinegar and stir until combined. Add the mayo mixture to the other ingredients and stir until well coated. Store in the refrigerator and serve chilled or at room temperature. * When I measured the entire finished recipe it came out to about 5 ½ cups total, so I listed the serving size as 6 scant cups. I thoroughly enjoy broccoli. Your recipe looks amazing! I think you meant serving size is 1 scant cup! This looks deelish!! This was soooo good! I brought it to my sister and brother in law’s house warming and everyone was asking for the recipe! I opted to use light mayo and omitted the vinegar and sugar all together and thought it tasted great! Thanks for always providing deliscious recipes! Already made this twice this week at my husbands request! So good-I love salads with a lot of different ingredients. Thanks! This was so good. I made it yesterday and brought it as part of my lunch today. Yum! Delicious!!! And so easy to make. My new favorite lunch! OMG SOOOOOOO good! My husband and I couldn’t get enough. Actually made a second batch to have for lunches for the week. Your videos are the best! Easy to follow and beautifully presented. Thank you and please do more! This was so good. Made this to bring to a Memorial Day BBQ, and this salad was the only empty dish on the buffet. Everyone Asked for the recipe. Do you think we could use greek yogurt instead of mayo to bring the points down even more? I am making this for a second time this weekend. It has turned out to be my favorite broccoli salad – as well as my husbands! With this less heavy dressing, the bacon flavor really shines. Delicious!